Our goal is to make the best tasting potato chip on the market. 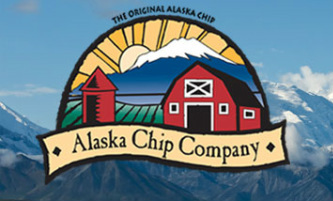 Our chips are made from 100% Alaska grown potatoes and are cooked by the batch and hand-seasoned. The reward is a thicker, crunchier potato chip that tastes great! Whether you are a long-time resident of Alaska or just visiting our state, we hope you enjoy our chips. It all begins start with select chipping potatoes grown locally in the rich fertile soils of Palmer, Alaska. The potatoes are then delivered weekly by the truckload to our factory in Anchorage. A 1,300 pound tote of Alaskan grown potatoes will then be emptied into a receiving bin where they will go through the process to become a fresh potato chip. The potatoes are then loaded into a batch peeler where they are lightly peeled, inspected and weighed into 40 lb batches in preparation for slicing. Next, the batch of peeled potatoes is fed into the slicer, which slices the potatoes into consistent slices to insure that every chip will have the same great Alaska crunch after cooking. The slices are then cooked in 100% peanut oil for approximately 5 minutes. As the slices are cooked they are continually stirred. When the chips stop steaming, they have officially become a potato chip. After seasoning they are inspected before being packaged. After seasoning, computerized scales precisely weigh and portion the chips for packaging. The automated bagger then seals the chips into air tight bags to ensure that the chips retain their freshness. Last, the cases are palletized and delivered throughout Alaska for your enjoyment!